Our cozy shop is located on the east side of Winterset's historic square. Our shop offers a cozy atmosphere for classes or open knitting time! Stop in and join us! In addition to our fabulous yarns for knitting and crochet, Heartland Fiber Co. now offers 100% wool 3-ply rug yarn for rug punch in an amazing array of colors. 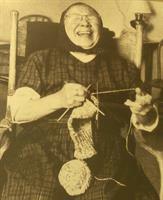 Check out our Calendar for classes and knit alongs! Pre-registration is required and refunds will only be given if the class is canceled. If the Winterset Schools are canceled due to inclement weather then any class scheduled that day will be postponed. You will receive 10% off supplies purchased for your class at Heartland Fiber Company. Have you thought about private lessons? You can now sign up for private knitting or crochet lessons at Heartland Fiber. Call us at (515) 468-8593 and we will put you in contact with the instructor. Cost is $15 per hour. Button, Button, who's got the Button? Heartland Fiber Co. does! We now have a wonderful selection from the Dill Button Company plus our beautiful Tagua Nut and Bone buttons. Finish your project with something special!